On Monday (President’s Day), Paul and I decided to go and find a place to spend all of the leftover money that we didn’t spend at Target and see if we could find any awesome specials on some new kicks. 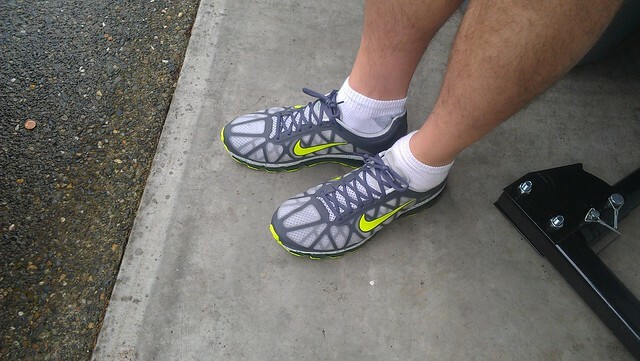 Paul has been running in his Nike Free’s for a while now and I have been in the Reebok version. I forget what they are called. And I am too lazy to Google it right now. 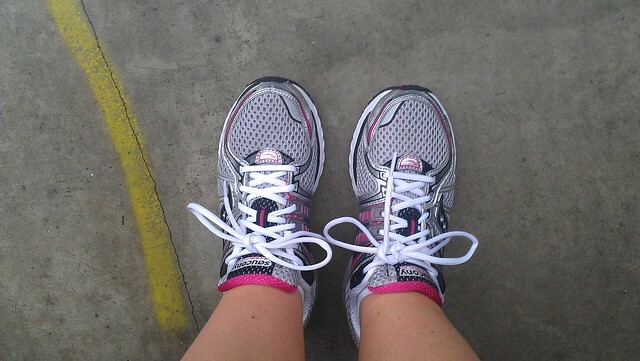 But I have had the feeling that I need to be running in something a little more stable so we decided to do the whole shebang and get our feet and gait looked at and assessed and get some good shoe recommendations from someone who knew what they were talking about. We hit up the internet and discovered this little huge gem of a store that was surprisingly only about 15 min away from our house, in a outdoor shopping mall that we frequent often but have never seen before. We are obviously oblivious to our surroundings very observant. They had this awesome system called Shoe Dog (I never really understood the dog tie in, but it was cute to see the colorful spotted puppies all over the place) that would size up our arches, analyze our gait and pop out awesome recommendation for fantastic new kicks that would change our lives forever. Ok, maybe not that last part but you catch my drift. I am a bad blogger and somehow spent about TWO HOURS in the store doing all this and didn’t manage to take ONE picture of the whole experience. I think I was too mesmerized with the number of choices, the constant back and forth on the treadmill to try everything out, and I had to pee. Thankfully they had a bathroom so that last thing was only a problem for a little while. But still. An awesome associate named Justin took Paul and I through the whole process. I’ve been through a little bit of a similar process before back when I had some issues with plantar fasicitis but this was really extensive and pretty cool. They even fitted us with custom inserts that we could try out for a while and bring back if we just weren’t feelin them. We both tried on what seemed like a hundred pair of shoes. It is pretty difficult to really get a feel for the difference. I found some a little more comfortable which had less stability so it was pretty hard to figure out which ones would really make me into the running champion that I aim to be help me to stay injury free as I continue to train. Paul ended up with his faves: Nike’s. That guy probably would have married Nike if I hadn’t come along. He loves them with all his soul. 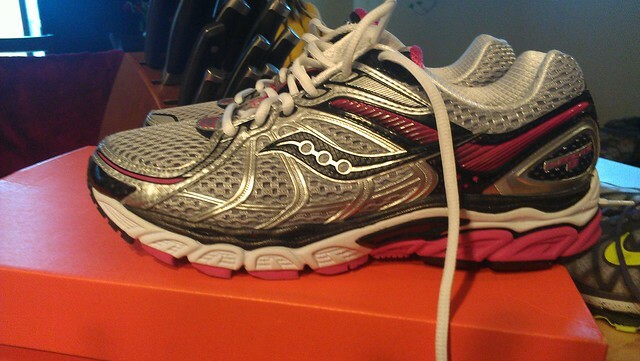 and these are the Superfeet that I also got to try out. 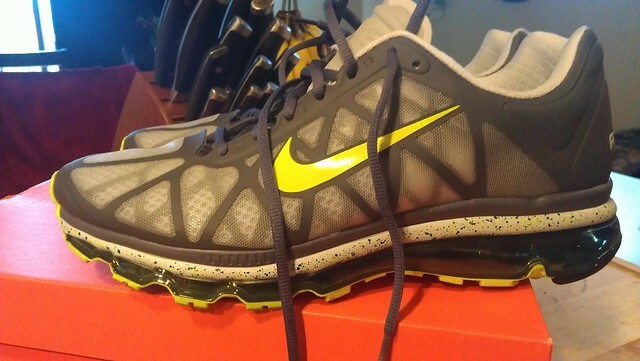 I had been in the green superfeet for a few years, but Justin said that they were probably a little much for me and that the blue or berry would be better. 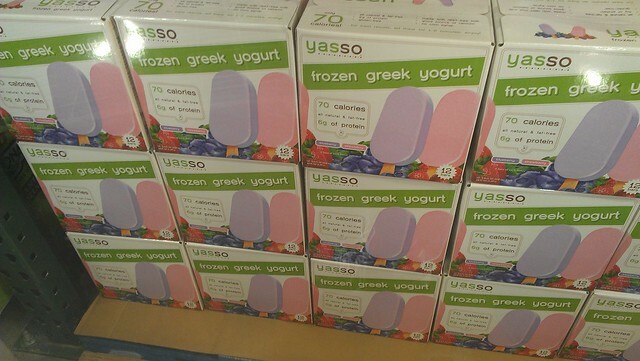 I’m gonna give these a whirl to see how they go. 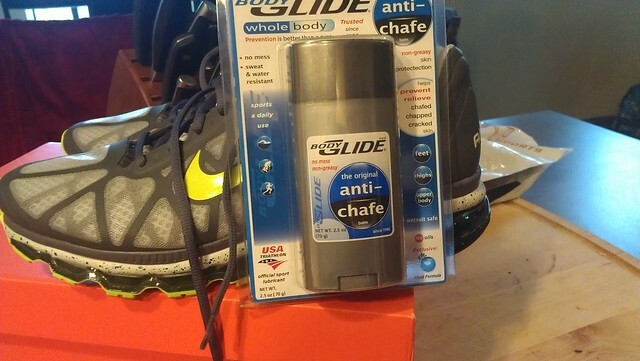 We also got a ginormous bottle of Body Glide. I have found that I can’t run with out it. Miracle stuff. After our hours spent figuring out what shoes to get, we went to the 3rd happiest place on earth, IKEA. We had lunch and browsed around at some containers and such for moving, but amazingly enough didn’t buy anything. I think that was mostly due to the fact that we were kind of crunched for time since we had to get home. We did however have enough time to get the $1 frozen yogurt cone. Can’t leave IKEA without one it seems. 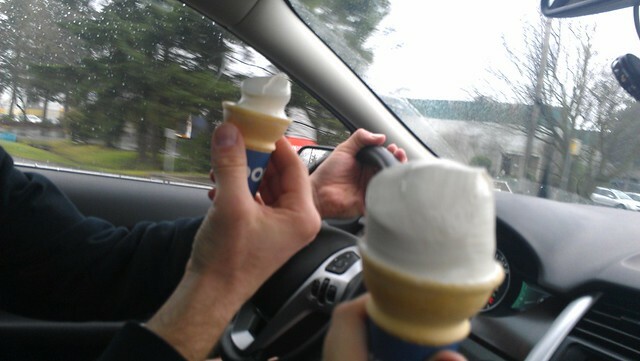 WARNING: Don’t drive and ice cream. Dangerous stuff. Paul is a professional, don’t try this at home. Later that day we made it to the gym for a run in our new kicks. 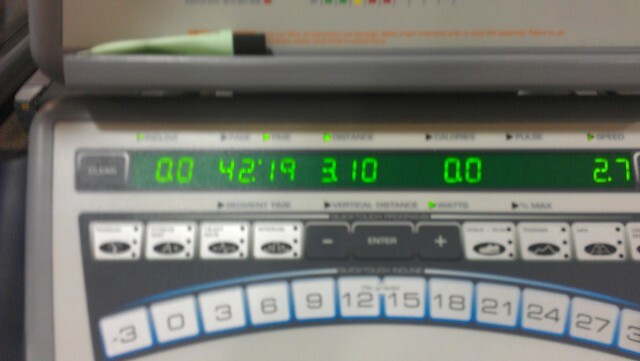 We both did an interval workout for around 2-3 miles for 30 min. I had some pain in my left heel and my right ankle was also hurting. I haven’t had either of these issues before so I am a little confused about whether or not it was the new shoes, or the new inserts, or just an off day. I’m going to keep trying though to see if the issues continue. 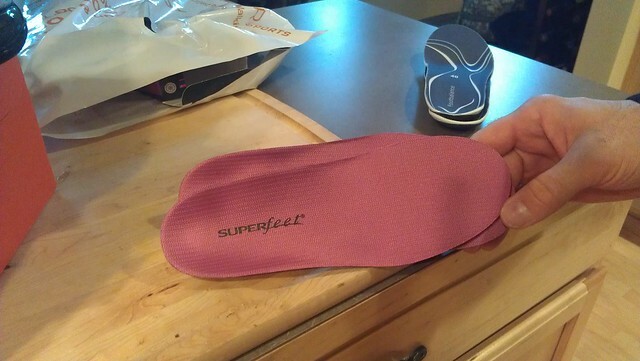 Also going to try the berry Superfeet to see if there is any difference. Paul wasn’t a HUGE fan of his either, but is also gonna give them a bit just to see if it’s just an adjustment thing. The awesome thing about RoadRunner Sports where we got them is that we can return them within 90 days for a full refund if we don’t like them. That’s a pretty sweet deal. 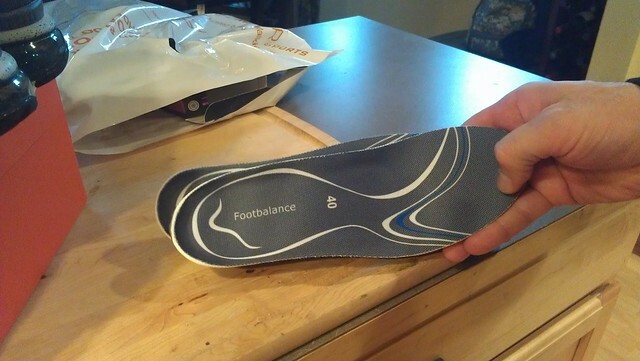 Have you ever had your feet analyzed? What was your last pair of new shoes? 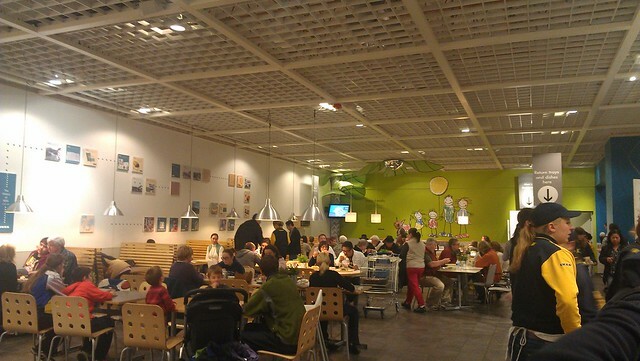 Do you love IKEA with all your heart and soul?